Vertical wind shear is weakening Hurricane Jose as it makes a cyclonic loop in the western Atlantic Ocean. NASA's Aqua satellite provided an image of Jose that shows the hurricane had become asymmetrical because winds were pushing the clouds away from the center of circulation and the GPM Satellite saw the strongest rainfall in Jose southeast of the center. The Global Precipitation Measurement mission or GPM core satellite passed over Hurricane Jose early on Sept. 11. Rainfall data gathered by GPM at 12:56 a.m. EDT (0456 UTC) showed the heaviest rainfall occurring within Jose was located in the southeastern quadrant. Rainfall rates were near 50 mm per hour (2 inches/hour). 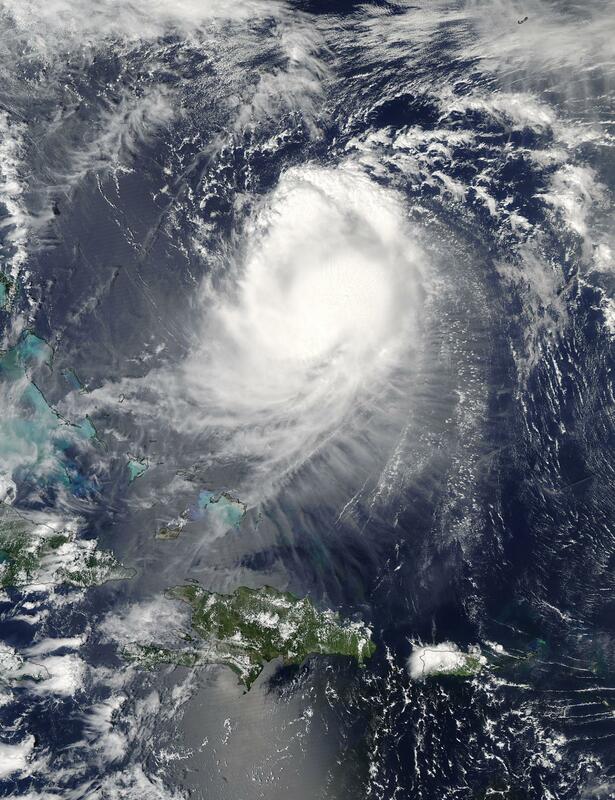 The Moderate Resolution Imaging Spectroradiometer aboard NASA's Aqua satellite provided a visible light image of Hurricane Jose on Sept. 11 at 2:15 p.m. EDT (18:05 UTC). Jose had weakened and appeared somewhat elongated because of wind shear from the north. On Sept. 12, the National Hurricane Center (NHC) noted that "Jose continues to be affected by 20 knots of northerly vertical shear, and recent microwave imagery shows that the low-level center is to the northeast or north of a large burst of convection that shows little evidence of banding." Jose remains far from land areas, so there are no coastal watches or warnings in effect. At 5 a.m. AST/EDT (0900 UTC), the center of Hurricane Jose was located near 27.5 north latitude and 69.0 west longitude, about 435 miles (700 km) north-northeast of Grand Turk Island. Jose was moving toward the east near 6 mph (9 kph) and this motion is expected to continue today. Maximum sustained winds have decreased to near 75 mph (120 kph) with higher gusts. Some additional weakening is possible during the next day or so, and Jose could weaken to a tropical storm later today. The estimated minimum central pressure is 987 millibars. Jose continued on its loop in the Atlantic Ocean. The NHC said turn toward the southeast is expected tonight, followed by a turn toward the southwest by Wednesday, Sept. 13.